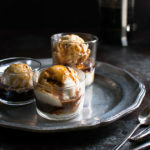 If I haven’t yet adequately professed my love for sweetened condensed milk with this, this, or this recipe, then maybe this recipe for Vietnamese coffee affogato will be the clincher. It takes the classic Italian dessert of vanilla gelato and espresso and adds a Vietnamese spin. I replaced the gelato with a simple, no-churn sweetened condensed milk ice-cream and used Vietnamese coffee instead of espresso. It has all the hallmarks of a good Vietnamese ice coffee but let’s you enjoy it in dessert form. The beauty of affogato is that it is so simple yet the taste sensation of the strong hot coffee contrasting with the sweet cold ice-cream has such depth of flavor that you would never guess how easy it is to pull off. Wanting to keep this dessert simple, I decided to use the ice-cream making technique of just folding cream that has been whipped to billowy peaks into some sweetened condensed milk and then freezing it. Two ingredients, no ice-cream maker required – how easy it that? I highly recommend getting some real Vietnamese coffee for this recipe. Of course, any dark roast coffee will work but it wouldn’t be as authentic (as authentic as a Vietnamese riff on an Italian classic can get anyway). I order my Vietnamese coffee on-line from Trung Nguyen (I get the Gourmet Blend) and it’s totally worth the extra effort. The coffee to ice-cream ratio is really a personal preference. To start, I like to pour enough coffee so there’s a small pool of coffee at the bottom of the bowl that the melting ice-cream can swirl into. Then I add more coffee as I eat my affogato so all the ice-cream doesn’t melt at once. But really, you just can’t go wrong with this dessert. In another bowl, whip the heavy cream until stiff peaks form, about 3 minutes. Gently fold the whipped cream, one-third at a time, into the sweetened condensed milk just until combined, being careful not to deflate the mixture too much or over-mix. Transfer the ice cream base to a freezer-safe container, using a spatula to smooth the top. Cover and freeze the ice-cream for at least six hours. Put coffee grounds in the bottom of a french press. Set aside. Heat water to boiling. Then pour the hot water over the coffee grounds and start a timer for 4 minutes. Put the top on but do not push down the press. When the timer goes off, firmly push the press all the way down. Scoop the ice-cream into serving cups and pour desired amount of coffee over the ice-cream. Ice-cream recipe adapted from The Kitchn.